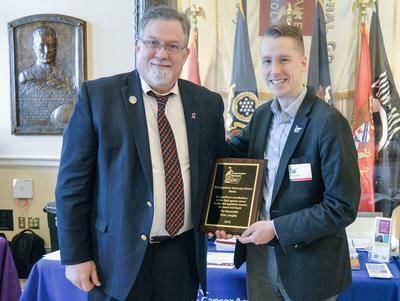 Brian Langley is honored with the American Cancer Society’s Advocacy Award in 2016. A Republican from Trenton, Brian Langley has just finished his fourth and final consecutive term as state senator for District 7, which includes Blue Hill, Brooklin, Brooksville, Deer Isle, Sedgwick, Stonington and Surry. His two years in the House beforehand mean that Langley has spent much of the last 10 years serving in Augusta. His desire for legislative office arose because “year after year, it became more clear that the government had ceased to listen to the people of Maine,” Langley said in a 2010 interview with Penobscot Bay Press. A legislator who has supported consumer protection for seniors, direct shellfish sales from harvesters to retailers, streamlining government regulations to help job creation, the creation of public charter schools, and a range of education reforms, Langley said the success of Maine depends on staying politically close to the center, which has not happened. His 10 years in the legislature helped him learn how to listen and listen well, he said, and to wait to hear all sides of a story before forming opinions. “What it really did for me was help me kind of find my voice in things, and give me great faith in the power in our community. When people get together locally, whether it be a school board or [board of] selectmen, people really need to not be afraid to speak up. I find that now I’m not so [likely] to sit there and be quiet as I would have in the past if it’s something I feel strongly about.